Note: If you wish to check whether you have master these questions, you may proceed to Take a Practice Test now with only questions from this DMV topic. If you do not have an account yet, Sign Up one now, it is FREE! # 1. This sign means? A. Warning that a stop sign is ahead. B. Forward traffic is not allowed. C. Wrong way, do not enter. D. A warning to stop right away. Explanation : Stop Ahead (W3-1) sign shall be installed on an approach to a primary traffic control device that is not visible for a sufficient distance to permit the road user to respond to the device. It is your advance warning that a stop sign is ahead of you. A. Loading zone for freight or passengers. B. Loading zone for passengers or mail only. C. Loading zone for freight only. # 3. This sign means? A. General information sign for a bus station. B. General information sign for a RV stop. C. General information sign for a truck stop. D. General information sign for a mobile home park. Explanation : General information sign for a bus station. # 4. This warning sign means? A. This road or street terminates ahead. B. Do not enter, wrong way. C. Two-way traffic ends ahead. D. Wrong way, turn around. Explanation : The DEAD END (W14-1) sign may be used at the entrance of a single road or street that terminates in a dead end or cul-de-sac. # 5. This sign means? A. Max speed 50 mph, minimum speed 30 mph in all conditions. B. Speed limit is 50 mph, minimum fine of $50 for violations. C. Max speed 50 mph, minimum speed 30 mph in ideal conditions. D. Speed limit is 50 mph, minimum fine of $30 for violations. Explanation : Max speed 50 mph, minimum speed 30 mph in ideal conditions. You are required to go slower then the posted speed limits in poor driving conditions like sleet, snow, fog, etc. # 6. This sign means? A. Traffic flows only to the right. B. Traffic flows only to the left. C. Your lane will end ahead. D. Do not drive past this sign, turn around. Explanation : Used to identify a one-way street, expressway ramp or the wrong direction or wrong side of a divided highway. Do not drive past this sign, you are going the wrong way, turn around. # 7. This sign means? A. Warning of divided highway ends ahead. B. Warning of divided highway begins ahead. C. Two way traffic advance warning. D. Winding road advance warning. Explanation : A Divided Highway (W6-1) symbol sign should be used on the approaches to a section of highway (not an intersection or junction) where the opposing flows of traffic are separated by a median or other physical barrier. Keep to the right. A. May be crossed to enter or exit a private driveway. B. May not be crossed for any reason. C. Should be treated as a separate traffic lane. # 9. This sign means? B. Wrong way, turn around. C. Traffic flows only in the direction of the arrow. A. Don't drink if you are going to drive. D. You are approaching a hill. # 11. This sign means? A. A sharp left curve warning. B. A sharp right curve or turn. D. 2 Lane traffic ahead. Explanation : If used, Chevron Alignment signs shall be installed on the outside of a turn or curve, the arrows show the direction of the turn or curve. # 12. This sign means? A. Advance warning of a cross intersection. B. X intersection ahead warning sign. C. No right turn warning. D. Railroad crossing ahead warning sign. Explanation : This sign warns of a railroad crossing ahead. # 13. What type of sign is this? B. U. S. route sign. Explanation : If County road authorities elect to establish and identify a special system of important County roads, a statewide policy for such signing shall be established that includes a uniform numbering system to uniquely identify each route. # 14. This sign means? B. Side road intersection ahead. C. Intersection warning ahead, roadway ends, must turn right or left. Explanation : T-symbol intersection ahead. Roadway ends ahead, must turn left or right. # 15. This sign means? B. One lane traffic, keep to the right. C. Traffic is prohibited from entering a restricted roadway. D. Road closed, construction ahead. Explanation : The DO NOT ENTER (R5-1) sign shall be used where traffic is prohibited from entering a restricted roadway. The DO NOT ENTER sign may be installed where it is necessary to emphasize the one-way traffic movement on a ramp or turning lane. A. You may turn during the red light. B. Pass only in the right lane. D. Do not turn during the red light. # 17. This warning sign means? Explanation : A PAVEMENT ENDS (W8-3a) symbol sign may be used where a paved surface changes to either a gravel treated surface or an earth road surface. # 18. This sign means? Explanation : School Crosswalk Warning Assembly. Warning of a school crossing, arrow shows the location of the crossing. Normally installed at the marked crosswalk, or as close to it as possible. Slow down, be prepared to stop, watch for children crossing. # 19. This sign means? A. General service sign for a hospital. B. General service sign for a doctor's office. C. General service sign for a pharmacy. D. General service sign for parking. Explanation : (D9-20) sign shall only be used to indicate the availability of a pharmacy that is open, with a State-licensed pharmacist present and on duty. # 20. This sign means? Explanation : Pedestrian crossing ahead. Slow down and be ready to stop. # 22. This sign means? Explanation : No U-turn. Do not turn around in the street or at an intersection. # 24. This sign means? D. No turn on red. Explanation : Left turn is prohibited. # 25. This warning sign means? A. Right lane stays to the right, left lane stays to the left. B. Keep to the right, merging traffic ahead. C. Keep to the left, merging traffic ahead. D. Traffic is permitted to pass on either side of an island or obstruction. Explanation : The Double Arrow (W12-1) sign may be used to advise road users that traffic is permitted to pass on either side of an island, obstruction, or gore in the roadway. Traffic separated by this sign may either rejoin or change directions. # 26. This warning sign means? A. Left curve ahead warning. B. Merging traffic from the right. C. Hairpin curve ahead, extreme right curve. D. Right turn ahead warning. Explanation : If the change in horizontal alignment is 135 degrees or more, the Hairpin Curve (W1-11) sign may be used. # 27. This warning sign means? B. Reduced speed limit, school zone ahead. D. End of school zone ahead. Explanation : The Reduced Speed School Zone Ahead (S4-5) sign may be used to inform road users of a reduced speed zone when engineering judgment indicates that advance notice would be appropriate. # 29. This sign means? Explanation : Deer crossing ahead. Slow down, be alert, and ready to stop. Deer have been known to cross the road in this area. A. Merging traffic is approaching from the right. C. Right lane ends ahead, stay to the left. A. Warning of a hazard. # 32. This sign means? A. General information sign for an aircraft manufacturing plant. B. No fly zone ahead. C. General information sign for an airport. D. Low flying aircraft warning. Explanation : General information sign for an airport. A. Slow down because the lane ends ahead. B. Be prepared for workers and equipment ahead. C. Change lanes and maintain your current speed. # 34. This sign means? A. General information sign for a library. B. General information sign for a bus stop. C. General information sign for a school. D. General information sign for a park. # 35. What type of sign is this? Explanation : U.S. Route signs shall consist of black numerals on a white shield surrounded by a black background without a border. This sign shall be used on all U.S. routes and in connection with route sign assemblies on intersecting highways. # 36. This sign means? B. School advance warning, you are entering a school zone. C. Pedestrians only, no vehicle traffic. D. Pedestrians ahead warning sign. Explanation : The School Advance Warning sign (S1-1). Warning that you are approaching or already in a school zone. Slow down and watch out for children playing or crossing the street, be prepared to stop. This is not a pedestrian crossing sign. # 37. This warning sign means? A. Merging traffic entering from the left. B. Merging traffic entering from the right. C. Two lane traffic ahead. Explanation : A Merge (W4-1) sign may be used to warn road users on the major roadway that merging movements might be encountered in advance of a point where lanes from two separate roadways converge as a single traffic lane and no turning conflict occurs. # 38. This warning sign means? D. Road maintenance crew ahead. Explanation : The Playground (W15-1) sign may be used to give advance warning of a designated children playground that is located adjacent to the road. The Playground sign may have a fluorescent yellow/green background with a black legend and border. # 39. This exit advisory speed sign means? A. Minimum advised speed limit is 25 mph in ideal conditions. B. Slow down, maximum advised speed is 25 mph in ideal conditions. C. Slow down, maximum advised speed is 25 mph in all conditions. D. Minimum advised speed limit is 25 mph in all conditions. Explanation : Slow down, maximum advised speed is 25 mph in ideal conditions. # 40. What type of sign is this? A. U. S. route sign. Explanation : State Route signs shall be designed by the individual State highway agencies. State Route signs should be rectangular and should be approximately the same size as the U.S. Route sign. # 41. This sign means? A. Route H highway sign. B. General service sign for a highway. C. General service sign for a hotel. D. General service sign for a hospital. # 42. This sign means? A. Right curve warning ahead. B. Merging traffic entering from the left. C. Merging traffic entering from the right. # 43. This warning sign means? B. Ahead is a sharp depression in the profile of the road. C. Ahead is a narrow bridge warning. D. Ahead is a sharp rise in the profile of the road. Explanation : DIP (W8-2) sign should be used to give warning of a sharp depression in the profile of the road. # 44. What type of sign is this? D. U. S. route sign. Explanation : Interstate Route signs may contain the State name in white upper-case letters on a blue background. # 45. This warning sign means? B. The road ahead curves sharply right, then left. C. The road ahead turns sharply left. D. The road ahead curves sharply left, then right. Explanation : The road ahead curves sharply right, then left. Reduce your speed and be alert. # 46. This curve advisory speed sign means? A. Slow down, maximum advised speed is 25 mph in ideal conditions. B. Minimum advised speed limit is 25 mph in ideal conditions. C. Minimum advised speed limit is 25 mph in all conditions. D. Slow down, maximum advised speed is 25 mph in all conditions. # 47. This sign means? A. Advance warning of a low speed sharp left curve. B. Road curves right, then turns left. C. Advance warning of a winding road. D. Advance warning of a right curve. Explanation : The road will curve sharply to the left. You need to reduce your speed and be alert. A. Right hand and arm pointing downward. B. Left hand and arm pointing straight out. C. Left hand and arm pointing downward. D. Left hand and arm pointing upward. # 50. This warning sign means? A. Winding road ahead, begins with a curve to the right. B. The road curves to the left then to the right. C. Winding road ahead, begins with a curve to the left. Explanation : Winding road ahead, begins with a curve to the right. As the symbol shows, the road will curve to the right, then to the left, then again to the right, then to the left. A. Entrance to full parking lots. B. Entrance to road construction areas. C. Entrance to dead-end streets. D. Wrong-way entrance on one-way streets and expressway ramps. # 52. This warning sign means? D. Road under water ahead. Explanation : The Low Clearance sign may be installed in advance of the structure. Example, the overpass has a low clearance. Do not proceed if the vehicle height is over the listed clearance dimensions. A. Trucks under 18,000 lbs. allowed. A. Continue at your current speed. B. You must stop ahead. C. Speeding is not allowed. D. There is a traffic signal ahead. # 55. This warning sign means? Explanation : Circular intersection ahead. Entering traffic must yield the right-of-way to circulating traffic. # 56. This sign means? C. No turn on red. Explanation : Right turn is prohibited. # 57. This sign means? A. Merging traffic from the right. B. Winding road, use caution. C. Slippery when wet, use caution. D. Sharp left curve then right curve, use caution. Explanation : The Slippery When Wet (W8-5) sign is used to warn that a slippery condition might exist. Use extreme caution and slow down when the road is wet or icy. Do not change directions suddenly. # 58. This sign means? A. Two way traffic warning. B. Warning for 2 lane highway. C. Left lane ends ahead. D. Right lane ends ahead. Explanation : Right lane ends ahead. Drivers in the right lane must merge into the left lane when safe to do so. A. Slow down and prepare to stop only if cars are approaching you. B. Come to a full stop, then go when it is safe to do so. C. Proceed carefully through the intersection, not always stopping. D. Stop only for traffic on an intersecting road. # 60. This sign means? A. No motor vehicles allowed. Explanation : This is the old design for school crossing. Normally installed at the marked crosswalk, or as close to it as possible. Slow down, be prepared to stop, watch for children crossing. # 61. This sign means? A. No playing in the street. Explanation : No parking symbol sign prohibits parking. A. Highway changes ahead to the right. B. Hiking trails ahead to the right. C. Hotel ahead to the right. D. Hospital ahead to the right. # 64. This sign means? A. Come to a complete stop, proceed only when safe to do so. D. Slow down and proceed if traffic allows. Explanation : When a sign is used to indicate that traffic is always required to stop, a STOP (R1-1) sign shall be used. Come to a full stop, then go when it is safe to do so. The STOP sign shall be an octagon with a white legend and border on a red background. # 65. This warning sign means? Explanation : Advance warning that two-way traffic is ahead. # 66. This warning sign means? A. Right lane ends ahead. D. Soft shoulder warning ahead. Explanation : Left lane ends ahead. Drivers in the left lane must merge into the right lane when safe to do so. # 67. This sign means? A. Road workers are in or near the roadway. D. Road construction flagger ahead. Explanation : A Workers (W21-1a) symbol sign may be used to alert road users of workers in or near the roadway. # 68. This sign means? C. No parking here to the corner. D. No stopping or standing. Explanation : Disabled/handicapped parking space. Reserved for individuals with disabled parking privileges. # 69. This sign means? A. Maximum legal speed is 50 mph in ideal conditions. B. Maximum legal speed is 50 mph in all weather conditions. C. Minimum legal speed is 50 mph in ideal conditions. D. Minimum legal speed is 50 mph in all weather conditions. # 70. This sign means? A. Warning of a winding road ahead. B. Warning of a right curve ahead. C. Warning of merging traffic to the right. D. Warning of a right turn ahead. Explanation : Warning that ahead of you, the road curves to the right. Be aware and slow down. # 71. This sign means? A. Warning sign for truck ramp. B. Warning sign for draw bridge ahead. C. Warning sign for hill ahead. D. No trucks warning sign. Explanation : The Hill (W7-1) sign should be used in advance of a downgrade where the length, percent of grade, horizontal curvature, and/or other physical features require special precautions on the part of road users. # 72. This sign means? B. A two-way intersection ahead. C. A four-way intersection ahead. D. Side road intersection ahead. Explanation : A cross road (four-way) intersection is ahead. Be aware of possible turning or entering traffic. # 73. What does this sign mean? A. A truck is 500 feet ahead of you. B. Slow down for the truck ahead. C. A farm vechicle, or tractor, is 500 feet ahead of you. 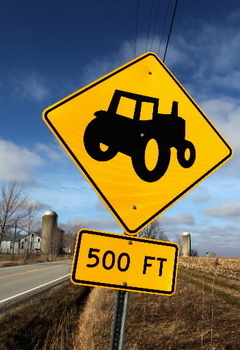 D. Caution and keep a 500 foot distance between yourself and the farm vehicle ahead of you. A. All traffic turn left. D. Truck route to the left. C. Merging traffic from the right. # 76. This sign means? Explanation : A NARROW BRIDGE sign may be used in advance of a bridge or culvert on which the approach shoulders are narrowed or eliminated. # 77. This sign means? A. Pedestrians only, no vehicle traffic. Explanation : School Advance Warning Assembly. Warning that you are approaching or already in a school zone. Slow down and watch out for children playing or crossing the street, be prepared to stop. # 78. This sign means? A. A flagger is stationed ahead to control road users. B. End of road construction. C. Road construction detour to the left. D. Road construction detour to the right. Explanation : The Flagger (20-7a) symbol sign should be used in advance of any point where a flagger is stationed to control road users. Be prepared to stop and follow the traffic flagger`s instructions. # 80. This warning sign means. C. A divided highway ends ahead. D. A divided highway begins ahead. Explanation : A Divided Highway Ends (W6-2) symbol sign should be used in advance of the end of a section of physically divided highway (not an intersection or junction) as a warning of two-way traffic ahead. A. Slow down if an emergency vehicle is approaching. B. Look both ways as you cross the intersection. C. Always come to a full stop at the intersection. D. Slow down and be prepared to stop if necessary. A. Right lane ends soon, merge left. C. Low place in the road. D. Lane ends soon, merge right. C. Turn right or left. D. Traffic flows only in the direction of the arrow. # 84. This sign means? A. Completely stop at sign and yield right-of-way traffic. B. Slow down for an approaching intersection. C. Slow down, completely stop if required, yield right-of-way traffic. D. Wrong way, do not enter. Explanation : The YIELD sign assigns right-of-way to traffic on certain approaches to an intersection. Vehicles controlled by a YIELD sign need to slow down or stop when necessary to avoid interfering with conflicting traffic. # 85. This sign means? B. Keep to the right of obstruction. C. Keep to the left of obstruction. Explanation : The Keep Right (R4-7) sign may be used at locations where it is necessary for traffic to pass only to the right of a roadway feature or obstruction. A traffic island, obstruction or median is ahead. Keep to the right.